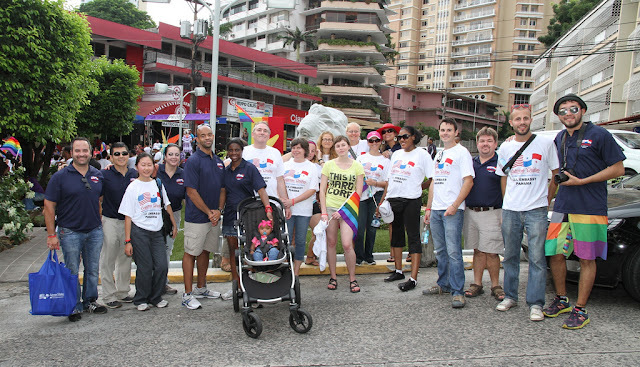 Photo: Members of the US Embassy in Panama participate in the annual Sexual Diversity March that took place in Panama City on May 25th of 2012 (From the Embassy's flickr photo account). It would be hard to overstate just how amazingly LGBT-friendly the US State Department has been under the leadership of Hillary Clinton even as she prepares to depart later this year. I first took note of the changes at hand in January of 2011 when the U.S. Ambassador to Honduras took the highly unusual step to publicly put pressure on the Honduran government to investigate an increasing number of attacks and murders committed against dozens of transgender women throughout the nation. That was soon followed by a Statement by President Barack Obama himself and offers from the State Department to provide intelligence and legal assistance. It all culminated with Honduran authorities grudgingly announcing that they had launched a special hate crimes unit in November of that year. Then came that extraordinary speech Secretary Clinton gave before the United Nations human rights office in Geneva in which she most memorably proclaimed 'gay rights are human rights' and made commitments to fight discrimination against members of the LGBT community throughout the world. 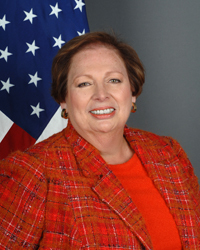 There was also the protracted fight over the confirmation of Mari Carmen Aponte as US Ambassador to El Salvador which some sought to derail in part because she had published a local essay in a Salvadorian newspaper applauding the Central American nation for the steps it had taken to prevent discrimination against its LGBT citizens. That essay was published on June 2011 during pride month following directions from the State Department for embassies to be visible on LGBT human rights issues on a local level. United States Embassies and Missions throughout the world are working to defend the rights of LGBT people of all races, religions, and nationalities as part of our comprehensive human rights policy and as a priority of our foreign policy. From Riga, where two U.S. Ambassadors and a Deputy Assistant Secretary marched in solidarity with Baltic Pride; to Nassau, where the Embassy joined together with civil society to screen a film about LGBT issues in Caribbean societies; to Albania, where our Embassy is coordinating the first-ever regional Pride conference for diplomats and activists to discuss human rights and shared experiences. And through the Global Equality Fund that I launched last December, we have strengthened our support for civil society and programs to protect and promote human rights. With such strong public commitment from the State Department and Hillary Clinton it is no surprise Ambassador Aponte felt in her right and duty to be visible on the issue last year. This year a number of US Embassies throughout Latin America felt the same way. HONDURAS: On June 20th, US Ambassador to Honduras Lisa Kubiske tweeted "The US Government supports the Honduran LGBT community in their fight for equality and respect #humanrights #LGBTpride" on her Twitter account (she also sent the message in Spanish). Critics of US support for Honduran president Porfirio Lobo Sósa quickly jumped on the comment and asked if US police and military funding to Honduras would be conditioned on ending killings against members of the LGBT community to which she indirectly replied "Many Honduran ‪#LGBT‬ have repeatedly told me how much they appreciate USG support of SVU which has arrested 12 ppl connected to LGBT murders." It turns out that on the same day Ambassador Kubiske sent those tweets she was holding a public LGBT pride month event in which she reiterated some of the warnings her predecessor Hugo Llorens had given the Honduran government a year and a half earlier. Honduras has serious issues towards the LGBT community because it does not respect their rights and for us that is a key issue. That's the reason why several officials from United States have come to Honduras to ascertain that investigations of these crimes are done in an effective and prompt manner... All vulnerable groups need protection and when crimes are committed against them they deserve an investigation and a proper judicial process. We certainly acknowledge the advances made during the previous year but we have to keep in mind that the number of violent attacks against the LGBT community have continued to increase, unfortunately. La Tribuna also noted Interim Director for the USAID office in Honduras Ken Seifert was a guest of honor "announced" he was gay and read excerpts from his published novel "The Rising Storm". USAID, as I wrote last month, is on the verge of launching an LGBT Global Development Partnership Initiative. COSTA RICA: US Ambassador to Costa Rica Anne Andrew celebrated an LGBT pride "roundtable" on June 27h inviting several Costa Rican LGBT advocates to her residence for breakfast. On the Embassy's online site, Ambassador Andrew also highlighted the 2008 wedding of Cynthia Wang to an unnamed female partner and runs an essay from Ms. Wang on the meaning of LGBT pride. Ms. Wang is the current Vice Consul in the American Citizen Services section of US Embassy in Costa Rica. Since we moved to Costa Rica my wife and I have felt extraordinarily well received. Some of our most intimate friends are ticos [ed. - a diminutive term for Costa Rican]. We feel a deep love and respect for this country and its culture and at a moment in time in which Costa Rica is debating LGBT rights let us hope that tolerance, compassion and a commitment to protecting human rights - a Costa Rican tradition - will also be reflected in public policies. Here is hoping that the Costa Rican government and its civil society extends protections to all citizens, whether they be gay or heterosexual. 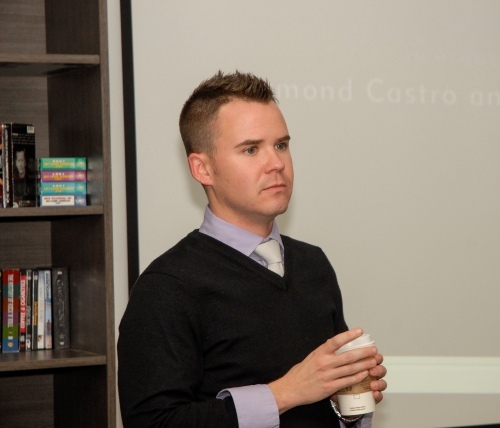 Jason Jeffreys of the U.S. embassy in Santiago spoke at the Gay Liberation and Integration Movement’s annual Equality and Human Rights for Sexual Diversity March. Jacqueline Vera, whose son Daniel Zamudio was brutally beaten to death in a downtown Santiago park in March, Education Minister Harold Beyer, a number of presidential candidates and lawmakers and Jon Benjamin, the United Kingdom’s ambassador to Chile, were among those who also participated. Jeffreys, whose boyfriend is Chilean, added that Zamudio’s death affected him personally. He attended candle light vigils and marches and spoke with Chilean politicians about what he described as the importance of anti-discrimination laws. Jeffreys also delivered a letter on behalf of the U.S. ambassador to Chile, Alejandro Wolff, to Zamudio’s family at his funeral. “I jumped at the chance to be able to speak at this event to continue with this support,” he noted. Chilean lawmakers in April passed an LGBT-inclusive hate crimes and anti-discrimination bill that had languished for seven years. President Sebastián Piñera and other leading politicians backed the measure in the wake of Zamudio’s death. Apparently that is a grande latte cup in his hand. Are there Starbucks in Chile? Oh, and he only spoke in English according to the Embassy's website. ¡Inglés sin barreras! Earlier in June, the Embassy also posted a podcast conversation with Julio Dantas, coordinator of Todo Mejora (the Chilean version of the It Gets Better Project) and Fulbright scholar Jenn Lerner who, according to the site, is conducting research on gay life in Chile. PANAMA: If I hadn't asked my friend Augutín Clement, I probably would have missed this one. It turns out that on June 25th the US Embassy in Panama actually sent a contingent to participate in Panama City's annual pride march. President Obama and Secretary of State Hillary Clinton have asked embassies throughout the world to promote and defend all human rights. 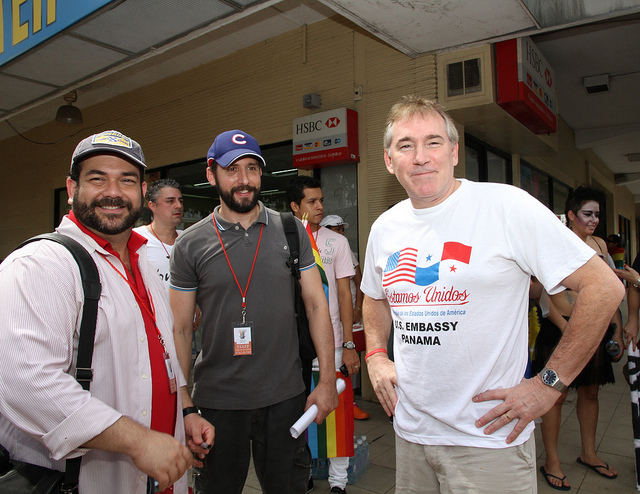 Members of the US Embassy and their families participated in the Gay Pride March in Panama to celebrate diversity, promote tolerance and support the fight against HIV/AIDS. This was the US Embassy's first official participation in support of this initiative in Panama. "The US Embassy rocked," says Augustín, "They had shirts that said 'Estamos Unidos' ['We Are United'] and as they went by people shouted 'Long live, Obama! Long live equality!' It was truly moving." That's a photo of Agustín, his hubby César Pereira and Duty Chief of Mission John Law as featured on the embassy's flickr account. Johnathan D. Farrar, the current US Ambassador to Panama, did not join the contingent but he did invite Augustín to the embassy's July 4th celebration in honor of his advocacy for LGBT rights in Panama. ECUADOR: A number of embassies not mentioned in this post did not necessarily actively participate in local pride events or held pride events of their own but added pride proclamations from Obama and Clinton on their websites as was the case with the US Embassy in Ecuador. Unlike those other unmentioned countries, they also went a step further. On June 22nd, the embassy also released a statement by Ambassador Adam E. Namm in which he applauded Obama and Clinton for their pride month declarations and highlighted the embassy's role as one of several "co-sponsors of the GLBTI Pride Week activities in Quito" (others include UNAIDS and several local and national government agencies). La Républica says that embassy staff participated in the inauguration of this year's film festival and a conference on human rights and the LGBT community. 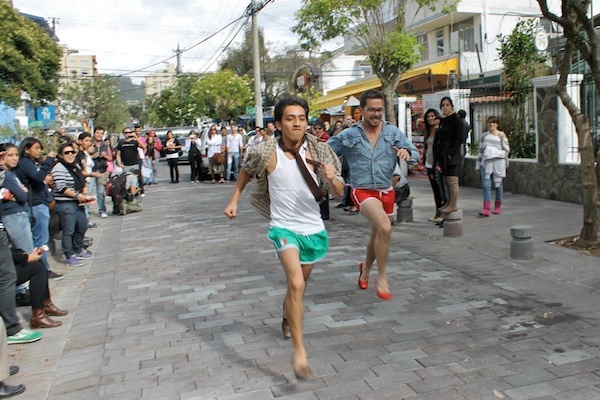 In addition the paper says that the embassy promoted a "High Heel Race" in which men tried to outrun each other while wearing high heels. The event is similar to annual events that take place in Washington, DC. and Madrid, Spain. According to the paper, the embassy said that the event was meant to make people think about the role of social gender norms. El Comercio has a photo gallery. Interestingly, while it didn't receive as much media attention as Mari Carmen Aponte, Ambassador Namm was also among a number of Obama diplomatic appointees whose confirmation was blocked by Senate Republicans for months on end. The lynchpin was Florida Republican Senator Marco Rubio who also had a large role in keeping Aponte's appointment in check until it became politically unsustainable for him to continue voting against their confirmation. Ambassador Samm started serving in his current diplomatic position on May 31st, a year after the seat had been vacated. EL SALVADOR: Finally, while Ambassador Aponte returned to El Salvador on June 30th and a bit late to celebrate LGBT pride, it was particularly gratifying to see her receive such a warm welcome despite claims from certain US Senators that she was not welcome there. It is also particularly satisfying to see some of the most homophobic conservative religious elements in El Salvador and the United States recoil in frustration. I won't translate this piece but will leave a link here for posterity. Thank you, Madam Secretary Hillary Clinton. MEXICO: On July 12th the US Embassy in Mexico invited a number of guests to the embassy and presented their entry into the "It Gets Better" project. The video went live on YouTube on July 16th. The US Embassy in Mexico has supported members of the LGBT community. In this video we have included representation from the art, business and government worlds (including members of our Embassy). All have come together to give an anti-bullying message to be shared with the It Gets Better Project. 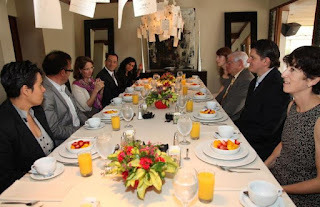 And on the embassy's blog they host a post by my friend Enrique Torre Molina about the video's launch which includes a cute photo of Enrique hanging out with Gabriel Gutierrez Garcia and other friends at the event ("The Embassy Gets Better" - Spanish). SPAIN (not part of Latin America, of course, but part of Ibero-America): On July 17th, 2012, the US Embassy in Spain held a historic first meeting with some of the top leaders of the LGBT movement in the country. They included Pedro Zerolo, Carla Antonelli, Augustín López, Raúl Garcia, Toni Poveda and Boti G. Rodrigo, the current president of the Spanish State LGTB Federation (FELGBT). Ambassador Alan D. Solomont met with leaders of the LGBT community in Spain at his residence on July 17th. They had a conversation about the history of LGBT rights in Spain, their successes and their challenges during the last few years and on how the Embassy can continue supporting human rights. Participants showed enthusiasm for recent comments made by President Obama in favor of gay marriage in the United States and suggested steps the United States might take to support LGBT rights - particularly in countries were those communities suffer great persecution. Referring to comments made by Secretary Clinton in Geneva in December of 2011 that "gay rights are human rights and human rights are gay rights", the Ambassador expressed his wish that this roundtable would only be the beginning of closer relationship between the Embassy and LGBT groups in Spain.